Information regarding art lessons, workshops, retreats and mentorship with award winning Canadian watercolour landscape artist, musician and traveler David McEown. To complement my life as a painter , I have been teaching watercolour and drawing as well as conducting workshops to prestigious art organizations, expedition tours and local art clubs part time for 20 years. It has been so rewarding to share my experience, way of seeing and technical ability to help advanced artists and beginners elevate their awareness and artistic confidence. Most of the year I am either painting on location or in the studio working on a body of work. However I do still book several workshops a year. If your organization is interested we would love to hear from you. Also I often work as artist is residence for adventure eco- cruise companies which is a great way to have art experience while on a adventure to the ends of the earth! I have taught hundred of folks over the years to draw polar bears or penguins! Also i have helped many photographers really understand and see composition as well as the colours of things. Please visit the workshop/ expedition page for upcoming trips and workshops. Also occasionally I mentor one on one , as well as private critiques may be arranged. • Explore the magical flowing spontaneity and essential techniques of watercolour, “the travel friendly medium”. • Discover painting as a form of meditation and “seeing”, allowing you to capture the moment with paper and brush. ◦ Tools, colours and materials are simplified for profound results with minimum equipment. The David McEown Watercolour Workshop was a huge success according to the feedback from the sixteen participants. The workshop began on Thursday evening with a well documented talk and slide presentation, "Sharing his passion and love of art and the natural world", to quote David's biography. He then mesmerized his audience, made up of club members and non- members, by rendering in watercolour a magnificent landscape on a full sheet of his favourite "Saunders Watercolour paper". Truly a treat to witness. The following two days of the workshop, David put us all through our paces beginning with exercises in colour theory each morning,and then the group set to work with their own effort based on David's teaching. Each day was supplemented with David painting and discussing very clearly his every stroke and use of colour for what ever mood he was painting. David is a fine watercolourist who charmed us all with his wit, stories and talent. He has painted in virtually every corner of this fine country. He has opened our eyes-wider. 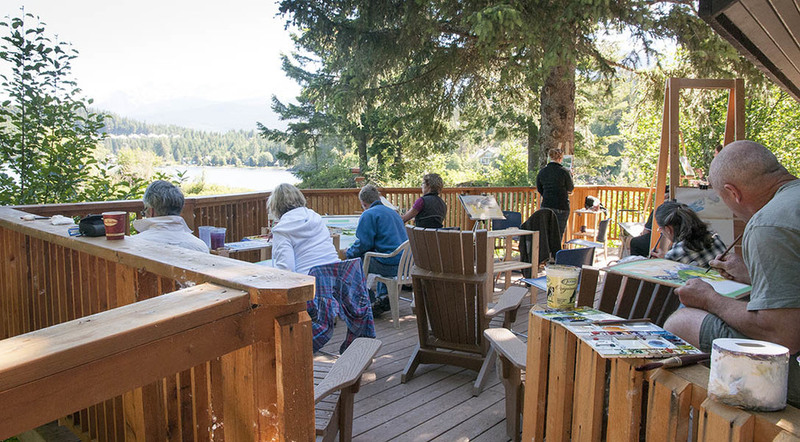 The Arbutus Ridge Art Club has been blessed in the past 3 years by having artists such as Robert Genn, Jack Reid, Pat Fischer, Grant Fuller and now David McEown, among others, to help guide our brushes in search of that perfection we all seek in ourselves.